Monday dawned after a night on the flood plain at the back of the Kings House at the top of Glencoe. We hit the road (the old military road that is) at 7.45. It started to rain at about that time and continued on and off all day. In the intervals of rays of sun the visability was great with some superb lighting effects. Especially the view of the Ben from the Larig Mor (Big Glen up which the Campells retreated pursued by the McDonalds after some battle a bit above the usual cattle raid). We saw several herons as well as grouse and ptarmigan and an as yet unidentified warbler. We left our options for the day open but the repetitive nature of the rain an the persistance of the current frontal system forcast until Thursday or Friday convinced us as to our best course. We walked from the top of Glencoe to Glen Nevis camsite 2miles out of Ft William in slightly over 8hrs with an brunch in Kinlocleven, about 21miles in not great conditions but showing the excellent line (if not the current quality) of the WHW route on the 17th century road built to subdue the highlanders. We arrived and checked in to the Glen Nevis campsite. One deficit of this otherwise imaculately groomed site is there is nowhere for those camping to cook, indeed teutonic style signs specificaly forbid it in every possible location. Tomorrow we will catch the train back to Glasgow having promised our feet a chance to recover from incipient trench foot. Yesterday was wet but we dried out late afternoon on the Bye the way Campsite at Tyndrum, as well as wigwams (that seem to have become omnipresent across the Western Highlands) they have a cooking and washing facility and a good drying room of which we made full use once again starting the day with dry boots. Can you see a pattern developing here? 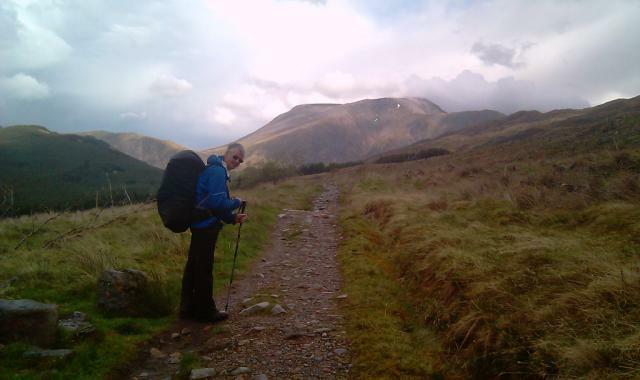 Yes, the tents were wet and once again it was raining when we set off, not to do a monroe as we had hoped but to walk to Kings House at the head of Glencoe via Bridge of Orchy over Ranoch Moor along the WHW. Once again the forecast for the tops (and the fact we could not see them) put us off. Quite honestly the walk across Telfords drove road, built in early Victorian times by order of parliament to improve comerce as the old military road was falling apart, was hard enough. 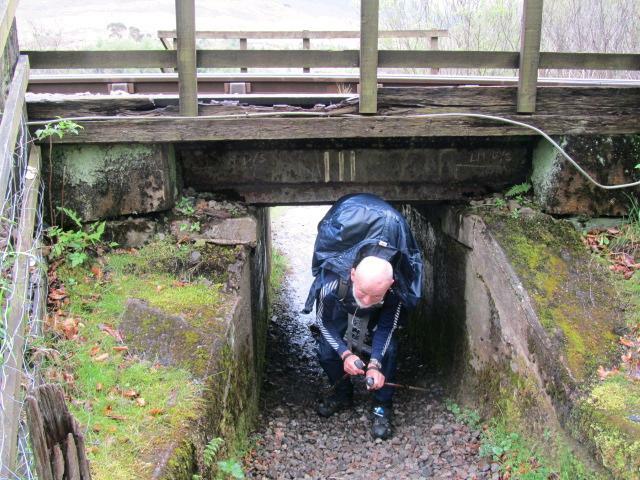 We had lunch sheltering under one of the good solid bridges over the many burns feeding the lochans of The Bog of Scotland, it was dripping water on us and we were glad to be there. It was that bad. There was a brief point as we approached Inverorran that the cloud lifted and excellent light and clarity gave good views but it was not until the approach to Kingshouse that the day looked up. We pitched our soaking tents, at the Oxymoron (previously mentioned keep up) just over the burn from the Kings House and while things dried in the over late sunshine we saw 3 deer paddling in the stream. They were not shy and we learnt later while having dinner that they are fed from the back door. The forecast is again poor for tomorrow so we will probably continue the WHW, this may result in a day early finish in which case a restful day on a train back to Glasgow is possible to pick up Tony's Landrover. The rain overnight was fairly heavy at times leaving wet tents to pack up. Our Golite Pinacle sacs have useful straps on each side, ideal for strapping wet gear on to. Rain continues intermittently and we have the usual game of on and off with wwaterproofs until the sun peers though the mists. We had hoped to climb Ben Lui on the way to Tyndrum today but the rain, mist and forecasts of 60mph gusts of wind on the tops rather turned us against the idea. So the low route it was, following the WHW as written with both guide books exaggerating the 19 miles to travel, only at our peak of fitness in Spain would we cover this distance in 5 hours and then with light packs, we think it is being talked up. The main road and the railway line are crossed several times by the WHW, the first under line is a cunningly shaped cut through that gets lower as you pass through necessitating a hands and knees exit for those burdened with sizable packs. The day improves and we dry out slowly, but the tops are in cloud and we see the sun occasionally. We have coffee at a farm shop midday by St Fillans's priory, now ruined and pass through the Millenium forest., this is the local attempt to reintroduce the Caledonian forest. Finally, via a still bare area where lead ore from a mine in the hills was separated, poisoning the ground, we arrive in Tyndrum at The Green Wellie Stop. That well known tourist mecca is humming with activity. A gold mine has replaced the lead industry in recent years. We have a couple of hours drying out time then the next front reaches us and this post sent from our tents with rain pattering on the outsides. Last night we camped a few hundred feet up the tourist path up Ben Lomond and this morning took down the tents just as the rain started at 0645 a damp day ensued with views of the largest body of fresh water in the UK (they seem to like their records round here!) severely curtailed. Ben Lomond is a bit like Snowdon via the PYG track but off piste to the north is fairly trackless until over Cruinn a Bhein (a Corbett). 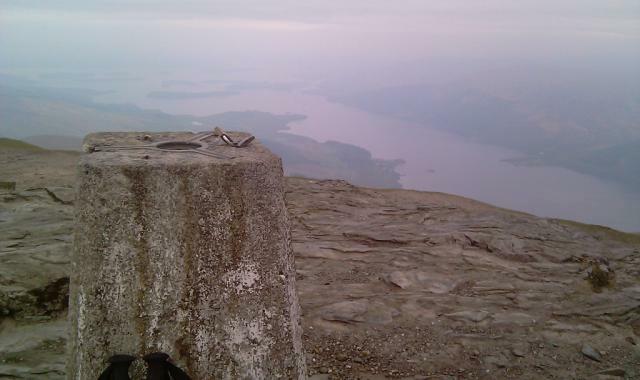 The mists did clear enough for a view of Lock Lomond to the south and we were puzzled by the two padlock attached to the trig point, maybe it would otherwise escape. We were back down to loch level by 1200 with a Munroe and a Corbett in the bag, but a wet walk up to the next stop of about three rmiles was needed to complrte the day. After a "swift arf" we climb the back road to a very nice bunkhouse (converted old church with original stained glass) well it is still raining we are wet and the tents are not, with two more days of rain forecast it seems a good idea to dry out. It is a bit of the UN along the route, probably as many from out of UK as from within. Organised transfers are used by many and many seem to think 7-8days adequate time. We suppose with no kit and up the main route with no deviations that's about right. 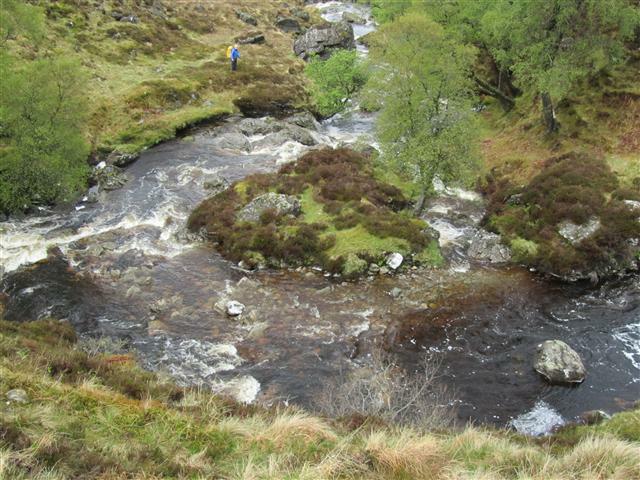 Tomorrow we are off into the hills again but it may not be much harder than the lochside which is said to be a fairly rough path up this section. We get up before the chickens having slept well after our meal in the"oldest" pub in Scotland. Unfortunately we missed the man to pay for our nights stay. Heading north past Drymen we climb up through the forest and past the wild campsite (surely an oxymoron ) and up Conic Hill a Marilyn of distiction (a Marilyn is a hill sticking up more than 150m above the surrounding country) . 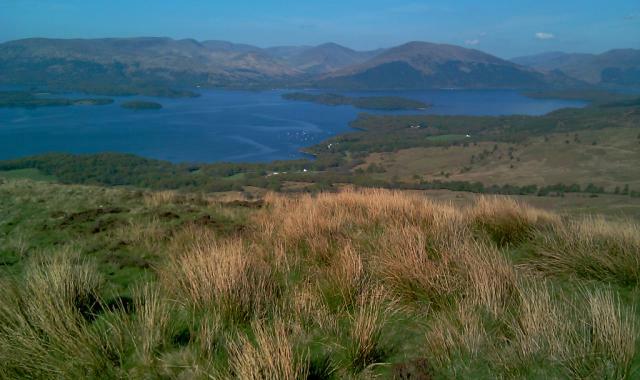 Excellent views over Loch Lomond and including our Monroe for tomorrow Ben Lomond were seen in perfect conditions. Descending down to Balmaha we bought three days worth of breakfasts to facilitate wild camping up the east side of Loch Lomond and then continued up the lochside to the Rowardennan Hotel to eat and then climb up the first 200m of Ben Lomond. The weather while perfect at present is set to deteriorate tomorrow so an early start should allow us to beat the front and be back at lochside for the next night. Final day of the Ramshackle Rally. Out early for the drive to Zakopane. there for lunch and to get Keith a ride on a cable car. At that point the rain started which followed us down the hill into Krakow. Our final meeting place is in the castle where we must present our beermat collection (don't ask, just another silly challenge) and discover how many of the original 35 teams have got here, with or without their car. And later tonight after a little liquid refreshment, the prize giving! Photo is of a typical Polish rural house. tes and went cross country from Strasbourg to Innsbruck rather than the conventional route. this allowed for lunch on the banks of Lake Constance (Bodensee) and a climb over the Alps into Austria. en route we managed to give away some pigs to confused German children. Look at the face of a recipient of a pig knitted by Jane. Yesterday we gave away a pig to a policeman in a patrol car complete with prisoner.